At HIGHLAND DARSHAN while noticing illuminated pathway of jeaps and vehicle that are moving towards divine spirit of shri lord venkateshwara , fetches us an inspiring aspiration for Darshan A Resort Kept Clean .A blissful abode of holiness and purity alive at the resort. Security Guard, Parking, Breakfast Services, Room Service, Travel Counter, Airport Transportation, Currency Exchange, Backup Generator, Swimming Pool, Restaurant. Attached Bathroom, H/C Water, Toothbrush/Razor on Request, Air Conditioning Room, Iron/Ironing Board, DVD Player, Wakeup Calls, Cable/Satellite TV, House Keeping. 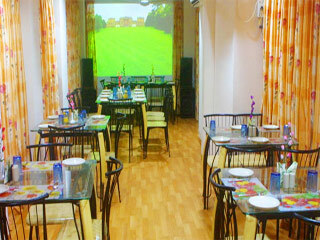 User reviews for "Highland Darshan Hotel Tirupati"